Signing a contract with the World Health Organization Collaborating Centre on Community Safety Promotion from Karolinska Institute, Stockholm, the City of Novi Sad was designated as a Safe Community on June 23rd, 2009. In the reception hall of the Novi Sad City Hall, in presence of more than 100 guests from Serbia and abroad, and with a proper music school program, the contract was signed by: Chair of the Novi Sad Safe Community Council Sasa Igic, PhD, Deputy Mayor of Novi Sad; State Secretary Tomislav Stantic, MD, on behalf of Minister of Health, professor Tomica Milosavljevic, MD, PhD; Mirjana Milankov, MD, PhD, leader of the WHO project Safe Community for Serbia; Dragan Jovanovic, PhD, Leader of the Safe Community City of Novi Sad; Bo Henricson, PhD, supervisor of the World Health Organization Collaborating Centre on Community Safety Promotion, Karolinska Institute, Stockholm, Sweden. The Novi Sad City Council, on the 44th session held March 2nd, 2009, (Article 52, Point 11 of the Novi Sad statute – cleansed text – Official Gazette of Novi Sad, number 43/2008), drew a Conclusion on the Inclusion of the City of Novi Sad, together with the Novi Sad National Centre for Injury Prevention and Safety Promotion, as a partner, in the WHO Safe Community project and in the International Safe Communities Network. Pursuant to the Conclusion, the City of Novi Sad is obliged to enable the implementation of six international indicators of Safe Communities. In order to perform the tasks from the Conclusion, the Novi Sad City Council, in cooperation with the Novi Sad National Centre for Injury Prevention and Safety Promotion, formed the Novi Sad Safe Community Council, an expert working body of the Novi Sad City Council (Official Gazette of Novi Sad, number 9/2009). The tasks of Novi Sad Safe Community Council are: - to carry out the activities for implementing the WHO International indicators for Safe Communities; - to create conditions for accreditation of the City of Novi Sad as a Safe Community, according to the WHO criteria; - to declaire the City of Novi Sad as a Safe Community, together with the representatives of the WHO Collaborating Centre Community Safety Promotion, Karolinska Institute, Stockholm, Sweden. 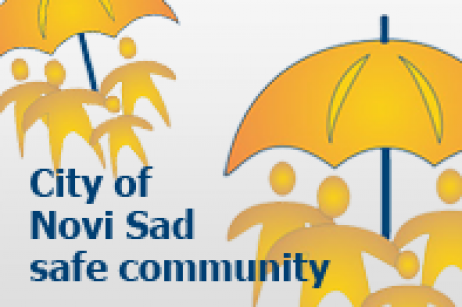 The following are named to Novi Sad Safe Community Council: Chair - Sasa Igic, PhD, Deputy Mayor of Novi Sad; Deputy chair – professor Sanja Stojanovic, MD, PhD, member of the Novi Sad City Council in charge of social and children’s welfare; members: - professor Aleksandra Mikic Novakov, MD, PhD, member of the Novi Sad City Council in charge of health; Ksenija Popovic, member of the Novi Sad City Council in charge of education; Sinisa Bubnjevic, member of the Novi Sad City Council in charge of transport and roads; Marko Narancic, MBA, member of the Novi Sad City Council in charge of economy; Dunja Rakic, PR coordinator, Department of Public Relations in the Novi Sad Mayor’s Office; Mirjana Milankov, MD, PhD, Director of the National Center for Injury Prevention and Safety Promotion; assistant professor Dragan Jovanovic, PhD, Leader of the Novi Sad Safe Community, National Centre for Injury Prevention and Safety Promotion and Dragana Coric, MSc, coordinator of the Novi Sad Safe Community, National Center for Injury Prevention and Safety Promotion. The Novi Sad Safe Community Council is obliged to provide the Novi Sad City Council with reports about the activities carried out to fulfil the tasks. Expert, administrative and technical work for the needs of the Novi Sad Safe Community Council is performed by the City Administration for Social and Children’s Welfare.